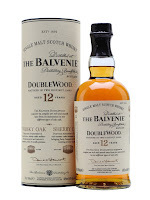 Balvenie. If there was ever a malt that would really be helped by being unchillfiltered, 46% minimum and natural colour, I think it would be this. At it's best, it's a fantastic whisky. 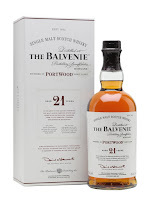 In fact one of my few 90 point whiskies was a Balvenie. (Sigh) Alas! Most of it is meant for the malty mass market. Nose: Light, fruity and malty. Some nut, light oakiness, some light sherry sweetness. Lots of honey and vanilla. Taste: Very silky and (shudders) smooth mouthfeel. Fruity and sweet, vanilla and honey, a bourbon waxineess, some herbal spice. Actually very bourbon-y for a sherry finish. Finish: Short length. A bit of bitter coffee. Notes: Perfectly acceptable and perfectly boring. Refill barrels for 10 years, Sherry for 2. Don't imagine they're 1st fill though. Nose: A sweet floral nose. Quite oak driven with loads of vanilla and honey, peach, brownie and sweet nut, fragrant oak, dark fruit- blackberry, clotted cream, a hint of port, milky coffee. Some developing lemon and fruity oak. Taste: Creamy arrival, coffee, oaky tannins, floral with fragrant oak and building fruit- raisin, fig, apple, pear, peach, some rum type notes- molasses, some spice- cinnamon, more tannins and milky coffee. Finish: Long length. Oaky toffee coffee and cocoa lasting nicely then the port hits with bitter dark chocolate. Notes: Not as good as I was hoping. I tasted this next to the Macallan 18 Sherry and it paled in comparison. Whoh whoh whoh. What the hell is the 'Golden' cask? Did they insert gold bars into the barrel? Did they coat the inside of the barrel with gold?! Calm down. It's the 'Caribbean Cask' nonchillfiltered for Duty Free a while back. Nose: Complex, intense and incredibly sweet. Banana, chocolate, vanilla, caramel, caramelised honey, some spice, citrus notes- intense orange but some lime too. Floral note- Roses and a little spearmint. Water: More fruity- pineapple, peach, plum, apple, cola. Malty toffee after some time. Taste: Spice- ginger and cinnamon with chocolate on arrival. A fresh sweetness, deliciously rich, sweet fruit and citrus- orange and lime again with lemon. Classic Balvenie honey as well. Water: Softer, with cream and less spice. Pineapple and a malty note. Finish: Medium/Long length. Citrus notes fade, delicious oaky taste dries slowly with a final cocoa powder kick. Lovely. 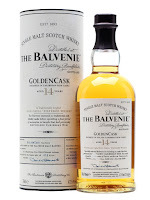 Notes: Balvenie as it should be, amazingly fresh and deliciously sweet.